We moderns like to think that we are altogether more concerned with hygiene than our ancestors. However, it appears that humanity has obsessed about oral hygiene since the first days when ‘thumb and fingers became capable of being opposed’ (Emslie 1980). This has been shown through excavations of Stone Age sites all over the world which have uncovered various products used for oral hygiene purposes such as chewsticks, tree twigs, bird feathers and animal bones. A man using a chewstick. Of the many early forms of the toothbrush, the chewstick was used most frequently and had the widest geographic spread. Its use is not only mentioned but discussed in detail in the Koran, the Jewish Talmud and the gospels of Buddhism. The first recorded use of the chewstick comes from ancient Babylon and is dated back to around 3,500 BC. However, as mentioned above, excavations of Stone Age sites show that it was used even before then. In its classic form the chewstick was made from twigs. One end was chewed until it became brush-like, while the other end was pointed and used as a toothpick. They were made from twigs of trees with aromatic properties so they both cleaned the teeth and freshened up the mouth. Some writers believe that the chewstick was only used to remove particularly unpleasant sensations and that teeth cleaning was not a ritual in the way that we would understand it. The written evidence, however, suggests that in at least some places, cleaning one’s teeth with a chewstick was very much a ritual. One religious text advocated using a chewstick five times per day. The chewstick had many advantages of other early forms of the toothbrush. However, there were shortcomings. One major shortcoming however, was the difficulty of application to the inner aspects of the dental arches (Emslie 1980). These shortcomings led to the development of the modern, bristled toothbrush. The bristle toothbrush was first developed in China. Typically, the handle was made of either bone or bamboo, while the bristles were made with boar hair. The bristle toothbrush was spread to Europe by traders, travellers and explorers in the 17th century. 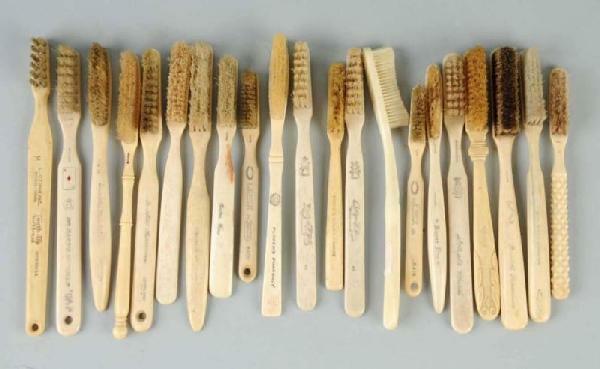 It is around this time that we get the first recorded use of the word ‘toothbrush’, from the English antiquarian Anthony Wood. In 1780 English rag-maker William Addis was jailed for inciting a riot. To beat boredom, he took to creating toothbrushes by creating a handle out of calf-bone and filling holes in drilled at the top in with boar hair held together by wire. Upon his release, he started selling his toothbrushes commercially. His children expanded his operations and thus we had the first mass-produced toothbrush. Examples of primitive bristle toothbrushes. The next major development in the history of the toothbrush came from America. In 1938 nylon was invented by Wallace Carothers of DuPont Laboratories. Within a year, it was being applied to commercially sold toothbrushes. This was good news for the boar and for us as nylon fibres proved to be sturdier and more efficient than natural bristles (BBC 2004). Natural bristles were swiftly displaced. Only one year after the development of nylon the first electric toothbrush was created. However, it was not available on the open market until well into the 1960s. Yes, the toothbrush has come a long way since our ancestors first used twigs to wipe their teeth. New developments are occurring each and every year and Mouthwatchers is at the centre of this. The humble toothbrush is rarely praised or romanticized but its importance cannot be underestimated. A survey conducted in the USA in 2003 by MIT named the toothbrush as the number one item which people said that they could not live without, beating both the car and the mobile phone. BBC 2004. The History of Teeth Cleaning [online]. Available from: http://news.bbc.co.uk/dna/place-lancashire/plain/A2818686. Connolly, T. 2010. The History of the Toothbrush: From 5,000 BC to the Present [online]. Available from: http://www.huffingtonpost.com/thomas-p-connelly-dds/mouth-health-how-long-hav_b_683535.html. Emslie, R.D. 1980. A history of oral hygiene measures. Community Dentistry and Oral Epidemiology, 8 (5), pp. 225-229. History Channel 2012. Who Invented the Toothbrush? [online]. Available from: http://www.history.com/news/ask-history/who-invented-the-toothbrush. Jardim, J., Alves, L. and Maltz, M. 2009. The history and global market of oral home-care products. Brazilian Oral Research, 23 (1), pp. 17-22. Library of Congress 2010. Who invented the toothbrush and when was it invented? [online]. Available from: http://www.loc.gov/rr/scitech/mysteries/tooth.html. Pennsylvania Dental Association 2013. The Invention of the Toothbrush [online]. Available from: http://www.padental.org/AM/Template.cfm?Section=Home&Template=/CM/HTMLDisplay.cfm&ContentID=13171. This entry was posted in Uncategorized by mouthwatchers2013. Bookmark the permalink.